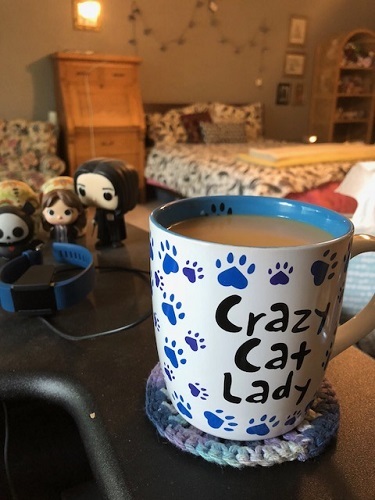 Sunday Coffee – District-wide Book Sale! Every year in April, the boys’ school district hosts a district-wide used book sale. 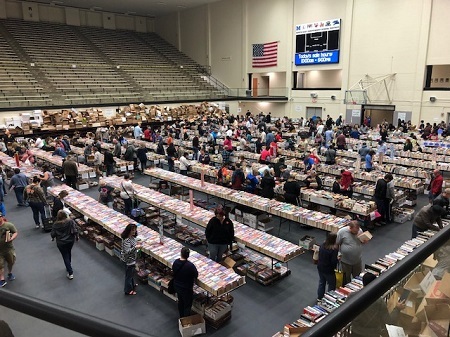 Thousands of books are donated and sold for under a dollar each over the course of three days. I’ve been most years when I’ve lived in San Antonio, and even though my current to-acquire list is quite low, I decided to head out yesterday to see if I found anything that caught my eye. As it turns out, I did find a few things! Firstly, I found two books for Jason – an early book by James Joyce called Stephen Hero, and a nonfiction volume called Sources of Japanese Tradition. Morrigan might like that latter one as well, since he’s heading to Japan later this year. For me, I found five books. One is a childhood favorite: From the Mixed-up Files of Mrs. Basil E. Frankweiler. This is the exact same edition I had as a kid, with the same illustrations! Then there’s The Shadow Cabinet, the third book in a series by Maureen Johnson that I really like. I still need to get my hands on the second book, and of course the fourth when it comes out, but I was glad to find this one! The third is The Mad Scientist’s Daughter, which I read a few years ago and still think about quite often. Then there are two books I don’t actually know: The Invention of Curried Sausage by Uwe Timm, which I’ve been told is a modern German classic, and a random book called City of Masks by Mary Hoffman. The cover and description of this one looked interesting, and for fifty cents, I figured I could afford to risk it! There’s a possibility my family might go back today for the last day of the sale, the “bag day” where you get a large bag and fill it as much as you can for $15, only $10 for further bags. I didn’t have much of a chance to look at the children’s books for some favorites from elementary and middle school that I’ve been trying to get my hands on. Who knows? I was told that the district got TONS of books this year and that they’re still putting out new ones on the floor as it empties. So maybe we’ll find some good ones today? 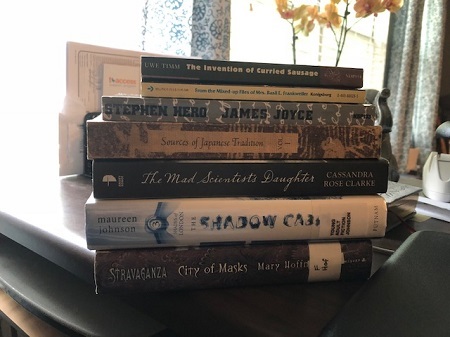 4 Responses to Sunday Coffee – District-wide Book Sale! I would need to stay away. Between my daughter and me? We would spend way more than we probably should and then go back for more. Did you grab anything the second time around? Sadly, we didn’t end up making it back that day. Too much else going on!